The collider activity center should attract people to climb and to merge sport, wellness, networking and leisure. At the same time it provides a platform for the company to showcase and display their products. 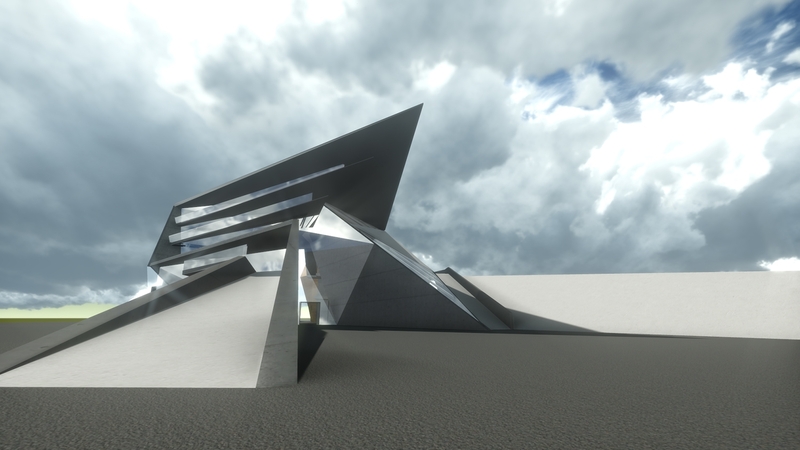 The building portrays the activity of climbing by reflecting the formal nature and asthetic of rocks. The formal principles were inspired by geological carvings and processes and were applied to the structural cores of the building. Entrance zones of the building appear as `carved out´ remains of a huge rock. The generated walls reach out into the landscape to create climbing walls and concrete ramps that form an urban plaza and the access to the visitors terrace, overlooking the inside climbing areas. Horizontal levels and the roof slide outwards of the building perimeter in south direction to generate sunshade. Inside the building the different climbing areas are combined into one open space with open stairs and galleries to offer the visual connection to the climbing areas. The climbing challenge and the asthetic of rockformation becomes the main visual and spatial attractor.